Hurricane Gustav has declined to either a strong category 2 or low-level category 3 storm. Praise God for this reduction in strength of the storm. We need to keep praying for the residents of the Gulf Coast, but this is great news. Summer is here–well, almost. Charis graduates from pre-school tomorrow, and the other kids have their last day of school on Thursday. Then, whew-hew, it’s summer! St Louis has not felt very “summery” yet. I know it is still technically spring, but with all the rain and cool temperatures, it is not the typical hot spring prelude to summer we experience here. I like to think that means we won’t have the typical 95+ days this summer, but that’s just wishful thinking. I am reading a couple good books. The Good Earth by Pearl S. Buck is compelling, but it is not a great read when our country is at the beginning of a recession. I just got to the part where the storyline gets more positive, so I am hopeful that I will feel better as I get further along. We’ll see. I am enjoying the writing, though. Belong to Me by Maris de los Santos is a contemporary novel on the NYT bestsellers list. I picked it up at the library today because I liked the cover. I choose books all the time because of the cover. My short stint working for a book publisher in the 90s caused me to be obsessed with good book covers. I am not ready to recommend this book, but I am enjoying the writer’s style and getting to know the main character. Since it is a bestseller, it is only a 7-day-loan, so I should have more to say about it soon. 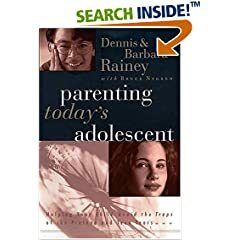 I am also reading Parenting Today’s Adolescent by Barbara & Dennis Rainey. So far after a little more than 2 chapters, it hasn’t told me anything I don’t know. But I am hoping it will offer some insights as we enter a new phase of parenthood that I am honestly not prepared for. I should have been reading everything available about 2 or 3 years ago. Now I am playing catch-up with our oldest boy having just turned 12. I really see why I need to be praying and seeking God in His Word now more than ever as I face our children entering adolescence one after the other in rapid succession! Can I just say that I entered their infancies and toddler years exhausted, but the next 15 years (span from Calvin being 12 to Charis being 20) are the scary ones to me. May I never lose sight of the need to bathe our family in prayer! You just can’t blog about everything. With that in mind, please pray for us more than you may have already been doing, or start if you haven’t been. We need it. 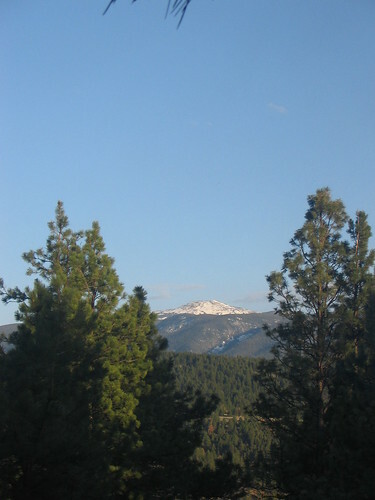 This is the view from the back yard of the home we have been staying in for the past 4 days. 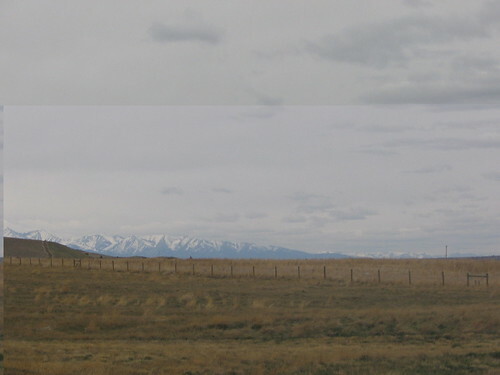 The weather since leaving Rapid City, SD, last Thursday morning has been anything but “cold and miserable.” We have enjoyed cool sunny days with temps in the 50s – 60s and evenings with temps in the 40s – 50s. The kids played outside more in 4 days than they have in the past several months. We have also enjoyed great hospitality from new friends in Montana. It is one of the most beautiful places I have ever seen. I am grateful for the opportunity to see such grandeur. Here’s one more photo, just for fun. This one is from a rest-stop on our drive out. said the very cheerful drive-thru employee at Burger King in Rapid City, SD, yesterday morning when it was 30 degrees, with howling wind, and snow falling. It was cold and windy and, to us, quite miserable when our day started yesterday. But as we headed west, we eventually got to the other side of the snow, then rain, then overcast skies to beautiful sunshine and breathtaking vistas as we winded through the mountains. Gorgeous. Hopefully, there will be pictures. Friends loaned us a GPS system, and we forgot our google directions, so we depended on the all-knowing box attached to the windshield for the entire trip. It didn’t let us down, despite our occasional lack of faith in it. We arrived safely to our destination and enjoyed a pleasant evening of good food and new friends. Remarkable. We had another tremor. It’s all over the news now, so most of you have heard about our little earthquake in the mid-west. The epicenter was about 130 miles east of St Louis, but I woke up to the earth rumbling under our house. I even felt a little post-earthquake seismic activity. I had trouble getting back to sleep, so I looked up earthquake stuff on line and reported my experience of the tremor to the government’s official earthquake tracking office. I decided to report it because, at the time, there was nothing showing up on the Internet about it when I searched. Right after I submitted my report, I found the page at the USGS website that showed all the other people who had reported the quake and their zip codes. I found it all very interesting, even though it wasn’t yet 5:00 am. When we lived near Seattle nearly 9 years ago, we had 2 earthquakes within a day or two . (BTW, I remember the date because I had just delivered my 3rd child, and my MIL was still with us helping out with the kids.) So with that experience under our belts, Mark and I felt sure today’s rumbling was an earthquake. This morning, I am feeling a little crummy after getting to bed too late and then having my sleep interrupted. Hopefully, my coffee will kick in soon, and I’ll be up to the tasks ahead. We are also feeling a little shaky about life lately. We know God is in control, but our faith is being tested–at least mine, I don’t want to speak for Mark. A series of client losses and having hours cut at his part-time job have made us very vulnerable economically. We are considering a move for another bi-vocational call to a church plant, and Mark is very diligently seeking full-time work as well as projects to keep us afloat until we have something more stable. Please keep us in your prayers. In honor of my Pennsylvania roots and my native Punxsutawney parents, I am obligated to wish everyone a Happy Ground Hog Day. According to the news, Punxsutawney Phil saw his shadow this morning, and that means 6 more weeks of winter. Of course, if he doesn’t see his shadow the other option is “spring is just around the corner.” Well, that’s a fairly undefined expression, so it doesn’t make much difference if Phil doesn’t see his shadow. Six weeks, around the corner:it’s pretty much a wash. Still, a small town in Pennsylvania gets its annual day of fame and boosts its economy with the events of February 2. So, Happy Groundhog Day one and all. 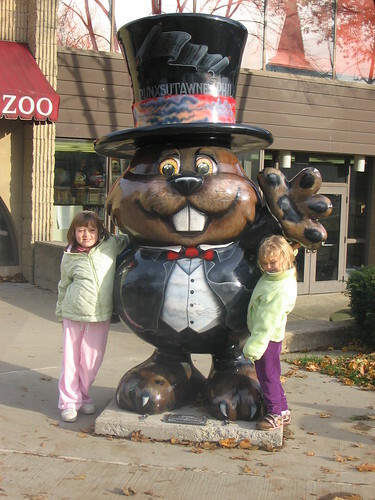 This photo shows our girls with the statue of Phil in Punxsutawney. The building behind the statue is where Phil is kept all year. There are statues of Phil all over Punxsutawney. In my last post, I essentially said, “Show me the snow.” Though I am not a native Missourian, I guess I’ve been here long enough to have to see something to believe it. So I guess God was listening–or reading my blog? Anyway, here’s a picture of the snow on our front porch which has a cover over it. There’s nearly 4 inches there, and lots and lots of snow all around us. It is supposed to be in the 50s by Monday, so we better enjoy it while it lasts. 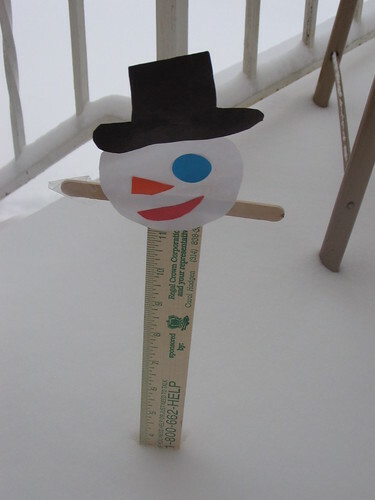 The snow measurer that Charis made in pre-school came in handy, didn’t he? BTW, he used to have 2 eyes. One fell off as he waited around the house for his opportunity to be put to use. Looks Like They’re All Closed! Snow. Predicting 6 – 12 inches. I will believe it when I see it. I grew up in Pennsylvania where it really snows, and in St Louis, we have never experienced a really big snow like I remember from my childhood. Ok, once, nearly 12 years ago when I was expecting Calvin, it snowed enough right before Christmas that they closed I-44 for the day. But in the combined 6.5 years we have lived in St Louis, that’s the only big snow I remember. I am weary from a variety of things this week, and you might think I would want the kids to go to school. But I don’t. I was hoping for a snow day tomorrow, and I just checked one of the local tv channel websites. It looks like all the schools around our area are taking the day off tomorrow. Happy February!